Missing the simplicity of childhood? Naptime? Trips to the candy store? Bubble baths? Now you can revisit all those warm and fuzzy memories with perfume. Fragrance powerhouse Demeter—whose brilliant scents include Gin & Tonic, Grass and Sunshine—has a new series of scents that will take you down memory lane, including a Mr. 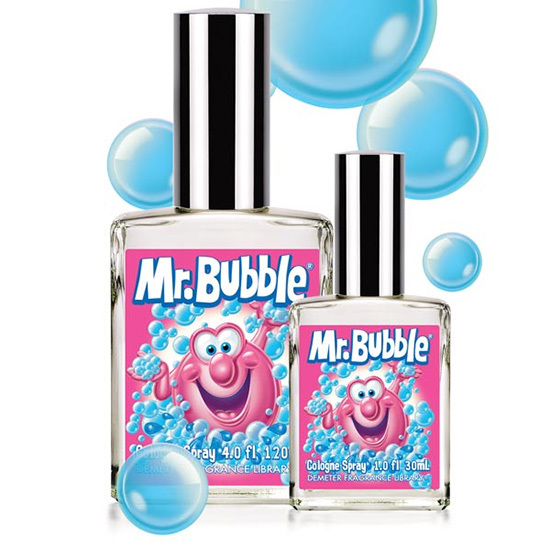 Bubble Cologne Spray, based on the part of bath time 5-year-old us enjoyed the most: bubble bath. The bubblegum-scented suds maker has been around for more than 50 years. Demeter replicated it with a blend of coconut, banana, peach, jasmine, rose and raspberry. If bubblegum isn’t your thing and candy is, you can also smell like Junior Mints, Dots or Tootsie Rolls as well. Incredibly accurate, these super-sweet sprays will have you craving your favorite treat and make you feel warm and fuzzy inside. Demeter is banking on that nostalgia. According to CEO Mark Crames, "Smells evoke the strongest sense memories, or emotional response to any sense." Demeter continues to create smells to evoke memories. But there are some scents that haven’t worked out yet; according to Crames, "blood, gunpowder, gasoline, puppy's breath, kitten's fur. For candy, I could never get Twizzlers the way I wanted them to be." Keep at it, guys. You’ll nail Twizzlers eventually. You can pick up a 1-ounce bottle of perfume for $20 from the Demeter website.